This is a triple challenge post. For this month’s WMS blog party and this week’s WMS sketch challenge. And Friday Mashup #85 to make a Project Saying Thank You. I’m afraid my photography is suffering today from the bright light in my craft room, not bright enough for no lights but bright enough to add a strange colour cast to the lights I do have. Grrr… In addition, I have a cold so I am a bit shaky so the focus is off. bummer. So sorry. I have a die cutting trick for you. I always hoard my favourite sheets of DP. So I was loathe to cut into another sheet of this paper for the label. But in my mind, nothing else really suited. 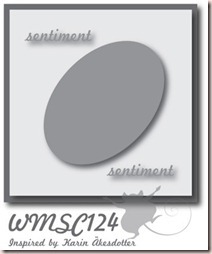 So I worked out exactly where I would place the final focal tag. Then I traced it. Since the larger mat would cover over the area below, I was free to ‘steal’ it for my label! Cool idea right? I had one small problem in that the card base showed through the holes in my die cut. This is only a problem with this ribbon treatment and not normally an issue. I solved it easily with a snippet of paper in a similar colour from the same pack! The spots are so tiny you definitely cannot tell. It was awesome to find a paper that already had words in the corners a la the sketch! But not so overwhelming that I couldn’t add my own sentiment as the focal image. My sister and I finally agreed on the style of her wedding favours and this is the ribbon treatment and tag style we are using so I had them in mind when I made the card. The favour is biscotti so they will be individually wrapped in bags intended for pretzels then wrapped in patterned paper. Then the tag will be added in a similar fashion but instead of tying the ribbon the way mine is above, the holes will be punched on the other sides and the ribbon will wrap around the biscotti and paper. The paper will probably have scalloped edges if I can figure out a way to do it that won’t take forever or require multiple punches due to dulling them because of so much use. 200+ favours is a lot! I’ll be sure to show you when I make them. Thanks for visiting, if you like what you see, be sure you don’t miss anything by subscribing. Subscription thingies for RSS and email are on my sidebar! Love it! So soft and pretty. Thanks for joining us this week at The Friday Mashup! Very pretty! Thanks for joining us again at The Friday Mashup! Such beautiful patterned paper you chose to use with this weeks sketch…love the little pearls scattered around and the great sentiment you chose. Beautiful paper and project! 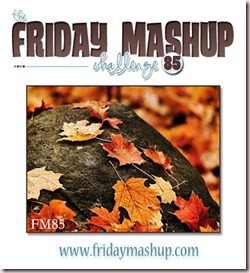 Thanks for sharing again on the Friday Mashup. What a lovely card using the pretty patterned paper! lovely card with those soft colors.Love from Holland. Its beautiful, love the white or cream ribbon.. the mat stack is very pretty with the sentiment. Thanks for the tip. Love all the gorgeous papers you chose for this beauty! Oh I love the way you threaded the ribbon! So beautiful with the sentiment…and that paper IS gorgeous! So important to think of ways to save every last scrap of our favorites 🙂 Such a lovely and soft thank you note, Rebecca!